Most business owners lack focus. They don’t really know what they are working towards so they have no idea what they should be working on. Building a successful business is a wild adventure. The best way to get where you want to go, is to know where you want to end up. Building a business is an exciting journey, but it can also be incredibly scary and overwhelming. To succeed, you need a translator. Someone who can break it down for you, and explain it in English. When you explore a new place, it's easy to get lost to wander into unsafe areas and to make dumb decisions. You need a guide. Someone with experience to show you the way. I can show you how to get where you want to go — in style. It's my personal goal to help more people achieve freedom through their businesses — whatever your freedom “destination” may look like, Business Class will help you get there. I have strategically crafted this program to help you implement cutting edge strategies and simple systems in your business to grow and scale with ease. Inspired by travel guidebooks, each Business Class Destination Guide is a visually striking and easy to follow, results oriented resource guiding you towards a specific business destination (aka result) such as learning how to be a better salesperson for your business, enhancing your brand with better photography, or becoming more influential by building better copywriting skills. I’ve used to scale my multimillion dollar online businesses in a wide variety of industries from fashion and home decor, to online education programs. Get access to the exact emails that I use in both my product and information businesses to create automated sales funnels so that you can effortlessly increase your sales. Plus, inside of this guide you’ll receive detailed templates that you can use to quickly create your own customized sales funnel. Use my proven email onboarding system to help more people succeed with your online programs, and dramatically decrease your refunds. Inside this training, I’ll take you behind the scenes of my most successful online programs and walk you through what to include in your onboarding emails to create star students and lifetime customers who can’t wait to enroll in every program that you ever release. The mistake most business owners make is spending all of their time and energy getting people ON their list, but then they have no idea WHAT to send them once they’ve signed up. Inside of this guide you’ll discover exactly what to send people so that you can quickly turn a brand new lead into a paying client or customer. There is no point in getting people to sign up for your email list if you have no plan in place for how to add value and sell to your leads. Inside of this guide, you’ll get access to all of the resources that I use like my editorial calendar and content creation inspiration process PLUS interviews with my team (like my main copywriter and editorial director) so that you can get a plan in place and never worry about what to send your list again! Get access to the revolutionary, step-by-step system that I’ve used to get thousands of people on my list by blogging (while still serving my current email list). This secret process has landed me interviews with some of the top media outlets and I’m going to take you behind the scenes and show you exactly how to implement it inside of your own business (tools, suggested resources, and more will be provided). 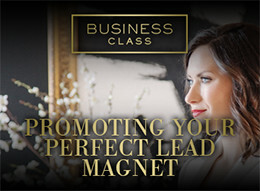 Inside of this guide, I’ll show you how to get your lead magnet (aka the free offer that you create to get people to sign up for your email list) the exposure it deserves - and how to make sure that you get it in front of the RIGHT people, so that you can build a list of your dream clients and customers. 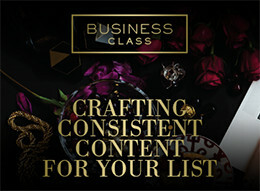 Discover exactly what you should create to get an endless stream of your dream clients and customers to sign up for your email list. I’ll show you how to pick the perfect topic that positions you so that you can build your list AND effortlessly increase your sales. 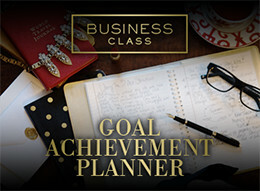 Use this resource rich planner to get crystal clear on what to focus on and create a plan to turn your business dreams into a reality. I’ll help you design and execute a process that you can put in place to make progress towards your most important goals inevitable. Inside of this actionable guide, I’m sharing step-by-step tutorials and software suggestions that you can use to elevate your brand, increase traffic, enhance social media engagement, skyrocket sign-up’s for your list, sell more of your products, increase the prices of your online programs and services, AND MORE! 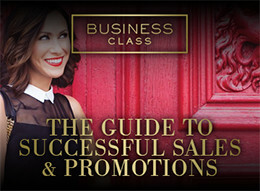 Use my proven sales system to host your most successful sale or promotion. 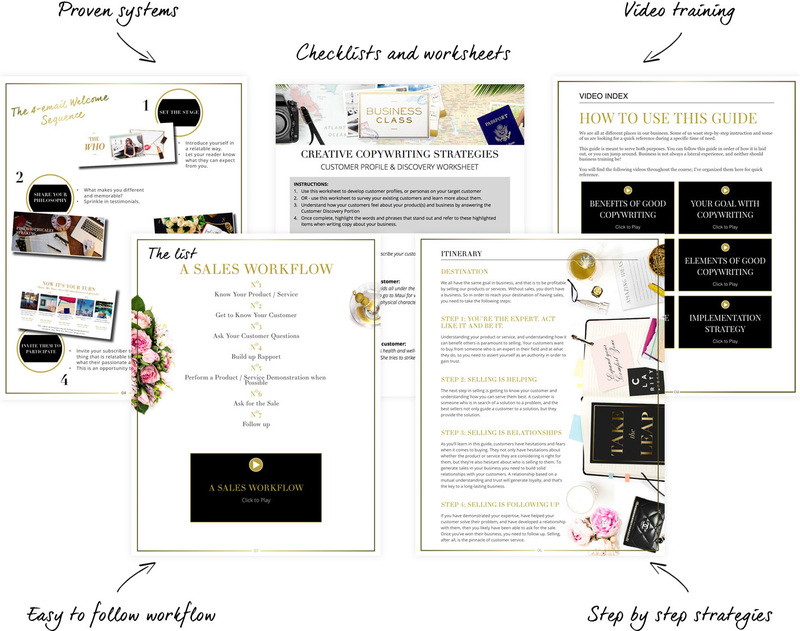 The strategies come straight from my physical products businesses and can be applied to generate buzz, build your list, and produce BOOMING sales within just a few days. This guide will provide you with a proven plan, and get you crystal clear on what you need to focus on to build a strong and successful online business (and share the nitty gritty of how to structure a successful launch). The key to standing out in a crowded marketplace is understanding how to leverage your unique ideas and originality. Inside of this guide, you’ll discover that creativity is a skill that should be developed inside of all of us to create our best work, design the most impactful marketing, and make the biggest difference possible in the world. • An insider look into how I run my businesses, the tools I use, and how I structure my life (i.e. morning routine). • I’ll provide tips on how you can apply my systems into your own life and business. • Information and access to your new Destination Guide, why it’s important, and HOW to put it to use immediately. Devin and I will also hold monthly live training calls with members. We&apos;ll share cutting edge lessons in online business straight from our own experience, address issues faced by the community, and leave some time for one-on-one Q&A. If you ever wanted our eyes on your business, this is your opportunity! Our live training calls are an anticipated event each and every month, with members participating from all over the globe. Some of the tools and strategies shared during the calls end up becoming some of the most impactful trainings of the entire program, and members talk about specific trainings for months and months within the community. Each call and presentation is recorded, so if you can’t make it live, it is still available to you! 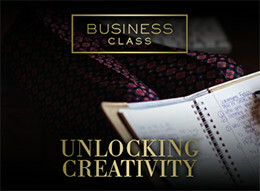 Business Class members also get access to our private community of entrepreneurs and business owners. The community is one where people support each other, connect, ask questions, get feedback, and offer up their own insights and encouragement in a trusted group setting. The Business Class team is always on-hand to assist as you go through the training guides or have general questions about your business, and we love to highlight member questions, wins, and feedback requests from the community within our weekly emails and during our training calls. Accountability is such a powerful and crucial element of business ownership. Accountability helps keep you motivated, it connects you with others, and accountability helps keep your goals front-of-mind. Without any sort of accountability structured into your business, you operate as an island, and are susceptible to the pitfalls of not having a support structure in place. All aspects of the Business Class program include an element of accountability to assist you in moving forward with your own business objectives. For example, we’ll include implementation challenges in the Destination Guides and on our training calls, and we encourage community accountability within the VIP Lounge. Whether you are are a solo-entrepreneur or a business owner leading a team, we want you to know that you’re not alone on this journey, and that we’re here to help you. Interactive Destination Guides that show you what you need to do next in your business to get where you want to go. Weekly Email Itineraries to keep you focused and moving forward in your business. Live Monthly Training Calls with Melanie and Devin on targeted topics to take your business to new heights. A private VIP Lounge where you can connect with fellow business owners and get the accountability and advice you need, when you need it. If you want a business that affords you freedom, you will need to structure it like so. Learn to live your life by design, instead of by default. I can show you how to build an amazing business – that works for you. I used to wonder the same thing. My husband Devin and I longed to travel, but we had multiple businesses to manage, including a factory and a warehouse in California. In spite of the apparent limitations, we were determined to design a live for ourselves of complete freedom. We had to make our own path which was hard and took many years; now we've mapped the route to make it that much easier for you. Our first big step was moving from California to New York City — and leaving the physical aspects of our businesses on the West Coast. Since then we’ve traveled to France, Anguilla, Italy, Switzerland, Japan and Capri. I’ve run my three thriving businesses from a streetside cafe in Paris, a private plunge pool, the Spanish Steps, and a chalet in the Alps. True success looks, tastes, and feels like freedom. Now more than ever, the real reason that people start businesses is to experience freedom. Our ambition is not to have the corner office with a huge company (and equally huge responsibilities tying you to it). It is having a business that allows us the freedom to #workfromwherever — whether that means from a café in Paris or the park with your kids. Business Class an ongoing learning environment that will provide the exact tools, strategies, and steps you need to take to make your #workfromwherever dream a reality. Click on a person to see what they have to say about being a member. This program has literally changed the direction of my business. As I grow and move forward, it's inevitable that I will run up against things I don't know. Accessing this program's training has given me the tools and knowledge to create a business that is so much more than I imagined. The course on Webinar's by Melanie Duncan provided a clear and concise structure, giving me huge confidence creating my first webinar! For less than a cup of coffee a day, I have been given the opportunity to grow my business into a 6 figure business. Want to change your business and change your life? Join this program! Melanie and Devin Duncan's training have in just one month of training, earned me over $15,000 in sales in my real estate business. Their easy-to-implement programs and personal expertise have allowed me to not only expand my online brand to so many platforms, but they've taught me and my husband how to earn NEW clientele DAILY with value-added marketing and honest service. OEA is so far the best investment we've made in our business. Thank you OEA! You'll never look back if you join this program! You will only be pushed forward by the momentum from watching what Devin and Melanie are doing and also by seeing what other members of OEA are doing. You have so many hands to lift you up and keep you going. There is a huge community of support and the things that you learn will propel you into the business and lifestyle of your dreams. Everything that the Duncan's do and teach is high class, high touch and most of all DOABLE! You absolutely can't fail unless you decide you do not want to try. Joining OEA has been the best investment for my business. Melanie and Devin teach clear useful tools, taught in a VERY supportive and positive atmosphere.Finally, I feel like I fit in here in this OEA community. Thank you Melanie and Devin for taking "the leap" to create this program. This is the "net" that I was looking for. In addition to learning invaluable business tools from Melanie & Devin I have found tremendous value in their private FB Group where I continue to meet like minded entrepreneurs who's relationships have now become a valuable part of my network. I am so excited about the results I've gotten from what I've learned with Melanie and Devin. By applying their strategies, I now have 3.5x more people than I've ever had in one of my workshops! Thanks for all of the information and inspiration that you provide! I'm learning tons. The Facebook group alone is priceless. I've made amazing connections there and it's a great place to go for feedback and support. All of the OEA training materials are 1st class and I'm learning a lot! Money well spent! If you haven't joined our family here at OEA yet, you should do it today! I promise it will be one of the BEST INVESTMENTS you will ever make for your business! You will have hundreds of people to help you and support you every step of the way! After applying the strategies in the Facebook Newsfeed Ads training we wentfrom 500 to 5,000 "likes" on our Facebook page in just 1 MONTH! In addition,we've added over 1,000 new emails to our list! All of the exposure from this not only increased our sales but it has opened up new opportunities for us. We have received so many personal coaching requests that we now have to take it to the next level and start a membership site! You guys walk the talk and you have made the Academy available at a price point that makes it doable for the typical entrepreneur with a ton of value! OEA is a very unique program. It's not just branding, just Pinterest, just social media, just email marketing, or just website optimization. It's comprehensive and offers value in ALL of those areas. The combined skills that Melanie and Devin have and are sharing is truly what any business owner need to be successful. I've had coaches and trainings before and I'm beyond impressed with the amount of knowledge I've received here in such a short time. What would I do without my OEA family? It is so great to be part of a group where we learn from the best together. Melanie and Devin are a "Super Couple" elevating us all to new heights. If you’ve ever traveled abroad, you know how quickly things can go wrong: one missing piece of the big picture can have disastrous results. Without a quality map — or, even better, a guide — you can end up taking wrong turns, missing out on exactly the things you wanted to see, and end up completely lost on the wrong side of town. The same can happen when running your business. Luckily, Devin and I have many stamps in our “business passports” — we've literally been there and done that when it comes to running a successful business. So we can help you navigate all your options, and get from Point A to Point B effectively and enjoyably. When you build a business, you’re not just designing a business you’re designing a lifestyle. When you build a business the right way, you can have the flexibility to live and work from wherever you choose. When we started our business back in 2006, I never dreamed I’d start a movement, but I wanted to build businesses that would afford me the freedom to #workfromwherever. We had to learn by trial and error what NOT to do, but through our journey we discovered how online business could give us the freedom we craved — both with a physical products business that relies on a factory and a warehouse and with our education business. In 2010 we took the leap and moved to New York City, while still running our seven-figure manufacturing business remotely. That was when we knew it was all possible and started planning trips to destinations we’d always wanted to visit — without putting our businesses on hold. I started posting photos of me working all over the world using the hashtag #workfromwherever, and I was blown away by the response. My photos not only got many likes and comments, but people started posting all kinds of creative photos of their own showing how they #workfromwherever. It was then that I realized that I had touched on something powerful. It’s a hugely powerful concept and a true freedom I want to help more people realize — which is why we built Business Class. 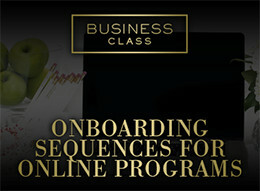 If a successful business that provides you with freedom is your goal then Business Class will help you get there. • You have an idea for a business, but you need help getting it off of the ground. • You already have a business, but feel like you lack clarity and focus in your day to day activities. • You know that you should be using cutting edge strategies, but you don't have the time to try and figure it all out yourself. • You're not really sure what's working in your business and need help identifying a profitable plan. • You feel overwhelmed by all of the different marketing strategies and want to learn a simple way to use them together (THAT WORKS)! • You want to sell more products online and want to learn from someone who has personally built multimillion dollar ecommerce stores. • You are interested in learning how to build a powerful personal brand online and want to someone with real life experience to show you the way. • You are just getting started and want a shortcut to the strategies that will get you results. • You look for excuses instead of solutions building a business is hard. If you want easy, you are in the wrong boat. • You are looking to take from a community, more than you are willing to give. This is a program filled with amazing people and I intend to keep it that way. • You are not committed to taking action and applying the valuable strategies that you will receive inside of this program. We only want people who are committed to growth inside of this community. 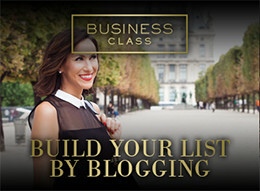 Who is Business Class for? Growing up my parents used to tell me to go to school and get good grades so that one day I could get a good job and live the American dream. I went to school, got great grades yet only encountered an American nightmare. With little to no jobs available my husband and I had to make something happen. We had to make a living somehow and we had to act fast. That is when we started building our network marketing business and found great success working from home. In no time, everyone wanted to learn how we were successful. People wanted to learn the strategies we used to prospect and recruit for our MLM business on Facebook. So my husband created an amazing information product, FB Prospecting Power, to show people exactly how we did it. For a while the product sold well thanks to word of mouth advertising but I knew there were a lot of people that we were not reaching. THE STRATEGIES WORKED IMMEDIATELY. In the first month of employing the strategies learned, our Facebook Fan Page went from 500 to 5,000 Likes and our sales soared! We had over 1,000 new e-maitls added to our database and traffic to the blog was higher than ever before. In addition, numerous coaching requests led us to launch a membership site two months later. Not surprisingly, Melanie and Devin Duncan’s training and service did not stop there. They also created a wonderful group on Facebook for all the members of this program to interact in. There I not only got feedback directly from Melanie and Devin but I was able to connect with thousands of like-minded entrepreneurs. I am a relative newborn when it comes to the game of entrepreneurship. By trade I am a by-the-books school teacher who thrives in structure and appreciates the rules. Needless to say, I was daunted by the challenge of joining Ella Dynae Designs, a start-up business specializing in custom, heirloom quality costumes and clothing for girls. I had been charged with the task of directing Ella Dynae's marketing and to aide in company branding. I knew I needed help and guidance and I needed it fast. It was wonderfully serendipitous that around this time I discovered Melanie Duncan's Online Edge Academy. I had enrolled in her Power of Pinning webinar, understanding the value Pinterest could hold for a company like mine, but needing the tools to optimize it. After the webinar, I was vitalized by Melanie's methodical and tangible approach to marketing in social media. I was suddenly in my comfort zone and knew that membership in this program would become my invaluable toolbox. Since becoming a member and utilizing the coursework, I now feel as though I have an obtainable and scalable strategy for marketing and branding. Each course is taught in a way that is enriching and conveys a level of mastery in the business. Yet at the same time, the teaching is always accessible despite my lack of expertise. In just a few months time, I have implemented Melanie and Devin Duncan's strategies for maximizing the effectiveness of Facebook advertising and Pinterest marketing and have seen AMAZING RESULTS! Ella Dynae's Facebook page likes and engagement have increased by 20%, Pinterest is now the 2nd largest referrer to our Etsy retail site, and OUR SALES HAVE MULTIPLIED THREEFOLD! Ella Dynae has become one of the top sellers for children's Halloween costumes on Etsy. I even utilized the email marketing course to help Ella Dynae get the word out about our participation in the Martha Stewart American Made Audience Choice Awards, helping us secure a win in the Style Category. This program has been my life-saver in this challenging endeavor and has empowered me to take risks and reap the rewards. 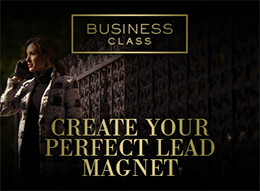 As a Client Magnet Specialist, Marketing Coach in layman’s terms, business was good but not as good as I’d liked it to be; especially after 4 years! I was struggling to meet new clients and to get my program and products in front of new clients. I was already blogging regularly, had a video blog and even an Itunes show but I knew I could do more! In Jan 2013, I made an intention to find someone who could really help me break the 500k mark as Id been stuck here for 2 years. It seemed that every conference call, webinar or live event I’d gone to was mediocre and not for those with extensive business experience. In late summer, a friend forwarded me an email from Melanie Duncan about a new academy she was creating. I have to be honest here and say that initially I thought Melanie was just another pretty face that could sell anything but the more that I began to dig into her company, the more I realized that this chick knew her stuff and maybe I could learn something. And, for under $100, even if I didn’t, it’s not like I was flushing thousands down the drain as I’ve done previously. I’d seen webinars before. I mean, unless you’ve been under a rock, you realize they have been the hot thing for the last couple of years now, but I honestly thought they were more appropriate for those with digital products and not those with services. When Melanie released the webinar training series, all of a sudden a light bulb went off. I could sell the digital products that I have to promote my coaching programs! 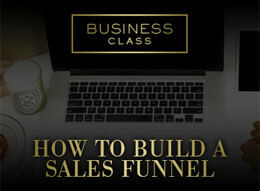 That same evening, after watching the training, I set a date and start spreading the word about my first webinar. I was a ball of nerves but I must say, I followed everything Melanie did even down to the clock within her webinar to say “It’s time to make a decision” and move into my offer and the countdown clock for the time remaining for their deal. The response was phenomenal! I sold 121 of my digital products within the first 15 minutes and 23 more, later that evening after the special was over. I was also able to sign 2 people up for my exclusive 1 on 1 intensive who had heard the webinar and loved the content. In total, my first webinar after following Melanie’s advice PROFITED me $28,654 within 24 hours! Boy was I thrilled! I then put that webinar up on automate and am waking up to several hundred every morning from what has sold in my sleep!!!! You’d think that was enough for me there but it wasn’t! This past week, I did another webinar to directly promote my 2014 coaching program. I offered amazing fast action bonuses and gave them a deadline just as Melanie suggests and by midnight, I’d signed 8 NEW CLIENTS into that program for $108,000!! Because of this program, I’ve already broken 6 figures for 2014 and the year hasn’t even started yet! I’m well on my way to breaking my goal of 7 figures! Thanks so much for this training. I take it back… you are much more than a pretty face!!!! You are brilliance! The training and amazing community inside this program has helped me get clarity on my business goals for the year, and has given me the tools I need to achieve those goals. I even added a new service, Facebook Ad Management, after going through the "6 Steps for Maximizing Your Online Business Growth" training and discovering that Facebook ads were a major pain point for my clients that I could help solve. As a result, I have DOUBLED my business income since joining the Academy by implementing the marketing and sales strategies I learned in the Academy. I'm getting new clients every week as a direct result of the Academy I am thrilled that I joined! I offer a no-questions asked, 100% money-back guarantee if you decide the program is not right for you. www.OnlineEdgeAcademy.com/help or click on our Support Page to cancel your subscription at any time.